From the rocky island of “Philae” floating on Egypt’s lifeblood, south of Aswan Isis was once believed to watch from her temple over the sacred Island of Biga; one of the mythical burial sites of her husband Osiris. Ancient Egyptian myths tales that Osiris was Egypt's beloved King who taught people how to live, worship, and cultivate. Driven by jealousy his brother Seth brutally murdered him, scattering his body parts all over Egypt, as a vicious sign of victory and strength. Pained by the ugly reality of losing her beloved husband, Isis gathered Osiris's body parts, and was believed to use her magical powers to resurrect him, making their story one of the most famous ancient universal myths. The Island of Philae was the center of the cult of Isis, and an important place of pilgrimage for worshippers until long into the Christian era. However, the construction of Aswan’s High Dam in 1898-1902, resulted in a partial submergence of the Island under water up till the 70’s. UNESCO led a project to save the refined monuments on the Island, by relocating them to the nearby Island of Agilika. Visitors can now enjoy a serene boat trip, available daily and booked from Aswan’s tourist offices, which drops them off the Southern part of the Island to appreciate the refinery of ancient monuments, and relocation efforts. Agilika Island took 8 years to be land-scaped in a magnificent manner to resemble the ancient Island of Philae, captivating visitors by its ancient spirit and composure. Philae served as the frontier between Egypt and Nubia from the late period of Egyptian history, precisely from 304 B.C. to 30 B.C. The Island was approximately 460 feet by 1510 feet, and was paired with the nearby island of Biga. Philae Island was called “Apo” in Heliographic, which translates to Ivory in English. Historians suggest that it was an important centre of trade, especially for Ivory, as the city of Aswan is located at the cross roads of the ancient trade routes of Egypt, Africa and Sudan where exotic goods were traded. 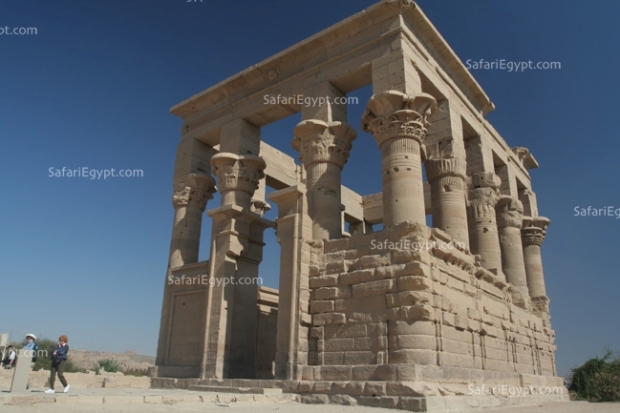 Built in the late Ptolemaic and early Roman periods, the huge temple combines ancient Egyptian and Greco- Roman architecture in perfect harmony. Neos Dionysos; Ptolemy XII built the temple’s first pylon, which is a grand one 66 Ft tall, magnificently decorated by original scenes of him massacring his enemies watched by Isis, her son Horus and his wife Hathor. The huge pylon leads to the famous Mammisi; which is the "birth house" of Isis's son Horus, built by Ptolemy VI, and later altered by many rulers. To the west of the temple lies the Gate of the Hydrian; discovered in 24th of August 394 AD to be Egypt's last Hieroglyphic script. Located on the Eastern side of the Island, this magnificent temple contains unique reliefs of musicians, among them Bes the god of singing. With a graceful location close to the edge of the water, the 14 columned Kiosk of Trajan lies. The kiosk depicts amazing scenes of the Roman emperor burning incense in front of Osiris and Isis. Today, the Island of Philae welcomes a remarkable influx of tourists everyday, who come from different walks of life to appreciate how modern architectural efforts, can save magnificent ancient history. Visitors are encouraged to visit the sound and light show, available in both Winter and Summer to narrate the history of the sight, and add to the beauty of the experience lived on the banks of the Nile.